Setting homework to remember knowledge from one lesson to the next could actually be bad for their memory. So stop setting homework on what you did in that lesson – at least until you’ve read this post. Bjork says that memories have two characteristics – their storage strength and their retrieval strength. Storage strength describes how well embedded a piece of information is in the long-term memory, while retrieval strength describes how easily it can be accessed and brought into the working memory. The most remarkable implication of Bjork’s research surrounds how storage strength is built. Good teaching of a piece of information can get it into the top left hand quadrant, where retrieval strength is high but storage strength is low. Once a chunk of knowledge is known (in the high retrieval sense of knowing), its storage strength is not developed by thinking on it further. Rather storage strength is enhanced by the act of retrieving that chunk from the long-term memory. This is really important. Extra studying doesn’t improve retention. Memory is improved by the act of retrieval. Recalling a chunk of knowledge from the long-term memory strengthens its storage strength. However for this to be effective, the chunk’s retrieval strength must have diminished. ‘Recalling’ a chunk ten minutes after you’ve studied isn’t going to be very effective, as your brain doesn’t have to search around for such a recent memory. Only when a memory’s retrieval strength is low will the act of recall increase storage strength. This gives rise to the spacing effect – the well-established phenomenon that distributing practice across time builds stronger memories than massing practice together. Rohrer & Taylor (2006) go a step further and compare overlearning (additional practice at the time of first learning) with distributed practice. They find no effect of over learning, and ‘extremely large’ effects of distributed practice on future retention. There is an optimal point for recalling a memory, in order to maximise its storage strength. At this point, the memory’s retrieval strength has dropped enough for the act of retrieval to significantly increase storage strength, but not so much to prevent it from being accurately recalled. Choosing the correct point can improve future recall by up to 150% (Cepeda, et al., 2009). There has been a common design of most studies into optimal spacing. Subjects learn a set of information at a first study session. There is then a gap before a second study session where they retrieve learned information. Before a final test there is a retrieval interval (RI) of a fixed time period. Studies such as Cepeda, et al (2008) show that the optimal gap is a function of the length of the RI, and that longer RIs demand longer gaps between study periods. However this function is not a linear one – shorter RIs have optimal gaps of 20-40%, whereas longer RIs have optimal gaps of 5-10%. Cepeda et al’s 2008 study looks at four RIs: 7, 35, 70, and 350 days. The optimal gaps for maximising future recall were 1, 11, 21 and 21 days respectively, and these gaps improved recall by 10%, 59%, 111% and 77%. Perhaps their most important finding is the shape of the curves relating the gap to the future retention. For all RIs these curves begin climbing steeply, reach a maximum, and then decline very slowly or plateau. The implication is that when setting a gap between study periods it is better to err on the side of making it too long than risk making it too short. Too long an interval will have only small negative effects. Too short an interval is catastrophic for storage strength. Homework is usually set as a continuation of classwork, where students complete exercises that evening on what they learned in school that day. This constitutes a short gap between study sessions of less than a day. We know that where information is to be retained for a week, the optimal gap is a day, and that where this is not possible it is better to leave a longer gap than a shorter one. For longer RIs, the sort of periods we want students to remember knowledge for, the optimal gap can be longer than a week. Therefore, if you want students to remember information twenty chunks of knowledge for longer than just one lesson to the next, the best homework to set is no homework! Setting homework prematurely actually harms the storage strength of the information learned that day by stopping students reaching the optimal retrieval interval. In this case, students who don’t do their homework are better off than ones who do! There is not enough good evidence of how to stagger multiple study sessions with multiple gaps. For example, we do not know where it would be best to place a third study session, only a second. 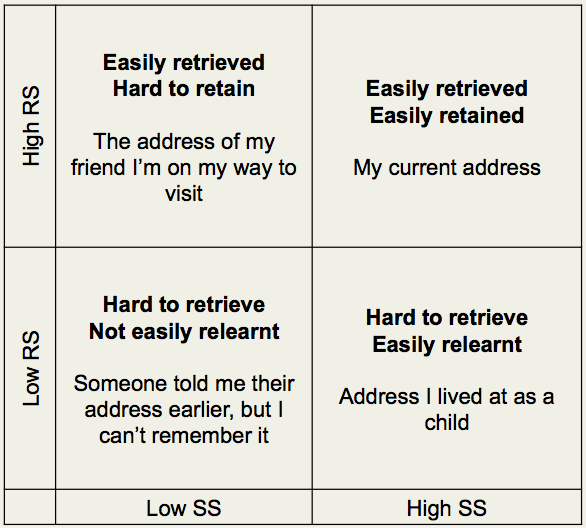 However we do know that retrieval is a memory modifier, and so additional retrieval should strengthen memories as long as the gap is sufficiently large for retrieval strength to have diminished. 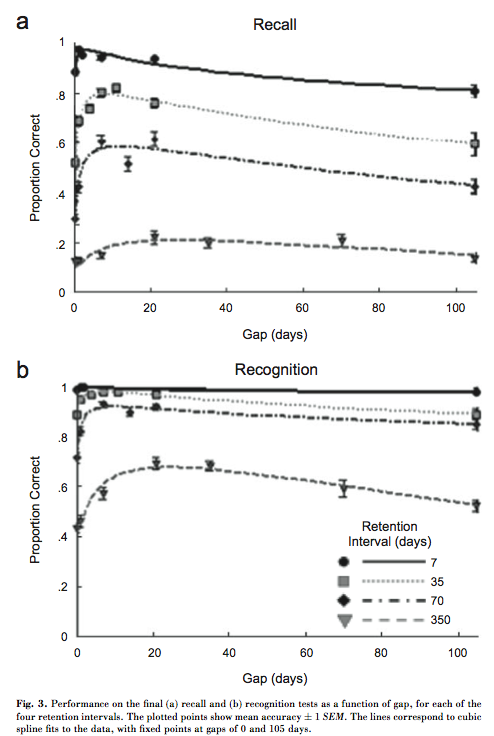 Given we know that retrieving newly learned information after a gap of one day is good for storage strength, it may be that studying with gaps of say 1, 3, 10 and 21 days are better for storage strength than a solitary study session after 21 days, where the RI is long (350 days or greater). In this case for teachers who only have one or two lessons a week, homework could help them make up the optimal gaps by providing for study sessions between lessons. The optimal arrangement of multiple gaps is a priority for research. We need to better understand how these should be staged, so that we can begin to set homework schedules that support memory rather than undermine it. Until then, only set homework on previously learned knowledge, and better to err on the side of longer delays. My students will be getting homework on old topics only from now on. This entry was posted in Teaching and tagged evidence, homework, interleaving, research, spacing on January 26, 2014 by dmthomas90. Interesting. I think care needs to be taken with respect to simplifying the problem too much. One of the problems with research is that the problem being studied must be reduced to a minimum number of variables in order to be able to actually undertake an investigation. In this case the question is about remembering bits of information. However, immediate homework probably achieves other desired outcomes. For example, if the homework consolidates understanding or processes, this will help build confidence. When the student encounters the theme/work again they might well remember that this is something they know they did understand or could do, and hence be able to tackle it again (and encouraging them to access the long term memory, leading to reinforcement and long term remembering etc…), the desired outcome. Maybe. Interesting. Why then do students dip after holidays? Maybe the first week back in September rather than go on to new stuff should explicitly try and get them to retrieve as much as possible from the previous year.it would be really interesting- though terrifying- to get them to re- sit exactly the same paper they took shortly before the holidays to see what had stuck. In fact, it would be really really useful if yr7 did this and gave the papers back to main primary feeders to analyse what was retained/ lost/ improved upon. And then this could be gap analysed for the coming term.